04.25.11 Alan Schalk defeated Jim Dubois in the final round of the Maine State Championship, played in Augusta on April 9-10, 2011, to score 5.0 points and become the 2011 State Champion. Matthew Fishbein, the tournament's youngest player, finished a clear second with 4.0 points. Richard Judy and Ruben Babayan tied for third with 3.5 points - both of which included half-point byes. Finishing with 3.0 were Jim Dubois, Barry Magda, Curt Brock, Don Plummer, and Dan Lavallee. 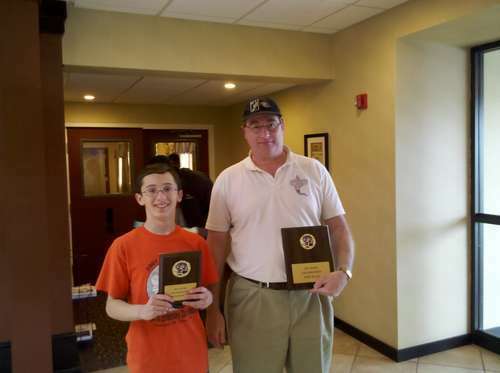 Tournament Director Philip Lowell (left) presents 2011 Maine State Champion Alan Schalk with the winner's share of the prize money, a trophy and congratulations after Schalk won his fifth straight game to finish with 5.0 points. Thanks to Andy Bryan and Brian Roderick for contributing to this report. The top two rated players Alan Schalk and Ruben Babayan won their first round games although Schalk needed all his time to defeat Barry Magda in a very tight match. Other first round winners were Matthew Fishbein, Andrey Savov, Aaron Spencer, Maggie Bryan, Kathy Richards, Don Plummer, Phil St. Jean, and Aaron Falzerano. Many draws due to accelerated pairings resulted in six players with 0.5 points: Steve Abrahams, Mark Woida, Curt Brock, Jon Buxton, Jose Lugo, and Dan Lavallee. There are 28 players competing in the two-day event. The playing room at Rooster's is excellent, and there is geniune comraderie among the players. Key matchups in the second round are Schalk vs. Fishbein and Savov vs. Babayan. Richard Judy who took a bye in the first round is black against Aaron Spencer while Steve Abrahams is playing Kathy Richards. Jon Buxton will be playing Mark Seedner (1/2 point bye first round). Don Plummer will play Jim Dubois, and Maggie Bryan will meet Mark Woida in a battle of Ellsworth Chess Club members. In the second round at the top board Alan Schalk defeated Matthew Fishbein in what Matthew described as a very strange game that was in the balance for quite some time before Schalk won. Aaron Spencer continued his strong play by defeating Richard Judy. Aaron completes his day with 2.5 points as he has requested a bye for the evening round. Maggie Bryan played Mark Woida to a draw to finish her day with 2.0 points as she also is taking a draw in the third round. Schalk continued his strong play in the third round defeating Andrey Savov to move to 3.0 points and clear first. Spencer is in second with 2.5, while eight competitors have two points. The other heavyweight battle in the third round pitted Fishbein vs. Abrahams with Fishbein coming out on top. The fourth round begins at 9:30 Sunday morning. Players with two points include: Savov, Fishbein, M. Bryan, Woida, Dubois, Barry Magda, Don Plummer, and Yuri Riabkov. Alan Schalk continues to show why he has the highest rating as he won his fourth consecutive game; this time with a quick victory over Aaron Spencer. Matthew Fishbein and Barry Magda won their games to advance to three points as well as Jim Dubois and Don Plummer. At 2.5 are Ruben Babyan, Richard Judy, and Aaron Spencer. Key final round match-ups include Dubois vs. Schalk, Magda vs. Fishbein, Judy vs. Plummer, and Babayan vs. Spencer. Alan Schalk defeated Jim Dubois in the final round to score 5.0 points and become the 2011 State Champion. Matthew Fishbein, the youngest player finished a clear second with 4.0 points. Richard Judy and Ruben Babayan tied for third with 3.5 points - both of which included half-point byes. Finishing with 3.0 were Jim Dubois, Barry Magda, Curt Brock, Don Plummer, and Dan Lavallee. Barry Magda won the Class B prize with 3.0 points. Top C prize went to Don Plummer and Curt Brock. Dan LaVallee won the U1400 prize. Selected games from this event will be posted soon. The champion at work at the board in round five. Clear second place went to Matthew Fishbein who scored 4.0 points. Alan Schalk (right) and Matthew Fishbein receive the adoration of the fans! Andy Bryan and Andrey Savov (not pictured). Anna Bryan (standing), who scored 1.5 points, kibbitzes in the tournament room. Praying for divine intervention? Jim DuBois (right) focuses while Alan Schalk combs the board looking for a plan. Tournament director Phil Lowell is reflected in the mirror. After the game was decided in Schalk's favor the two players engage in a post-mortem of what may have been. Second-place finisher Matthew Fishbein (right) plays Barry Magda in round five. Curt Brock, always dangerous, managed to win a four pawn vs four pawn endgame against Class A player Steve Abrahams. Dan LaVallee (left) receives the U1400 prize and congratulations from TD Phil Lowell. The tournament was graced with the presence of long-time Maine player George Zimbis. The players on the top board are reflected in this artistic shot. Notation a-la Boris Spassky. Yuri Riabkov's scoresheet shows impeccably neat long algebraic notation. Don Plummer shows TD Phil Lowell his recently-completed game with Richard Judy as Judy looks on. Matthew Fishbein (left) and Barry Magda discuss ideas in review of their game. The two-day tournament was held adjacent to Roosters Restaurant in Augusta (just opposite the Augusta Civic Center). Another Maine winter down, we look forward to summer tournaments. Thanks for a well run tournament, Phil. The primary drawback to this tournament was on the second day when the other half of our room was booked by another group who were very loud, making the playing conditions terrible. Is there no money in the MECA coffers to pay for both sides of the room for 2 days? It would be nice for the state championship to be played as a round robin instead of a swiss style as that would truly indicate a champion. Unfortunately, time and busy schedules do not allow for this to occur. I used accelerated pairings because it was announced on the tournament flyer that they would be used . I liked it . It stops those big 1st round 400 to 500 USCF rating point "mismatches" . Why were accelerated pairings used if the tournament was five rounds for only 28 players? Hi Dan : An excellent tournament report with notable exceptions. Too many pictures of the tournament director and the final picture of Richard Judy and myself is with Don Plummer, Richard's opponent for round # 5 not Bill Loring.